So, you have eventually decided to break the tradition of booking a hotel room for your next business trip. Stepping out of your comfort zone and into a new style of accommodation need not be so daunting. The comforts and security of a hotel reception desk and onsite dining facilities should not limit you to experiencing something new. A serviced apartment has all the basics of home living – a kitchen, bathroom, living area with dining-table and sofas plus a separate bedroom (or two) all make for a spacious, cosy stay. Knowing what to expect before you arrive at your serviced apartment will take away any elements of surprise – unless you quite fancy going into the ‘unknown’ to invigorate your trip. Serviced apartments are generally located in city centres close to shops, restaurants, pubs, sporting facilities, entertainment, large corporations and office blocks. They are also close to rail, road and air transport links to make travel easy and readily achievable. Most serviced apartment providers have an online booking system but if you prefer the human element to securing your stay, then there is also the option of making a phone call. Images of each apartment type and location are available to view on provider websites. Once your booking is made you will receive an email confirming your booking, address of your apartment and directions of where to park, where to find the concierge desk to collect your keys and directions from there to your accommodation. A dedicated parking bay means you are assured of a parking at no additional cost to your stay. Once you have ‘reached your destination’ the space is yours to enjoy. Prefer to eat in, need to wash an outfit, got a business plan to finalise? You can do all those in your apartment at your leisure and at no extra cost to your stay – well apart from popping across to the local supermarket to stock up on supplies. 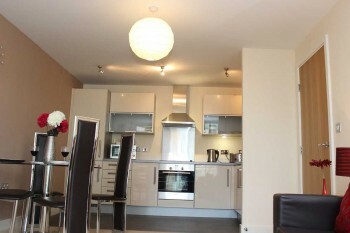 The main advantages to taking on a serviced apartment include the fact that they provide ’boutique’ level quality. Apartments are fully furnished including kitchens stocked with all the basic utensils and appliances to ensure a comfortable stay. Services offered include weekly maid services, laundry facilities, broadband connections and secure parking. These services are available with hotels too, but at an additional cost and under their terms. Serviced apartments operate on very similar lines to hotels, with no deposit, no contract and with set rates from one night to several months. For business travellers needing accommodation, the availability of serviced apartments may offer the most ideal and flexible solution. 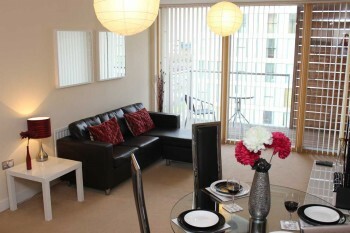 With a choice of number of bedrooms, features and easy terms, this is a stylish and affordable choice worthy of a stay. Surviving your fist stay in a serviced apartment should not be too daunting as you will find it similar to booking a self-catering cottage for a leisure break or to just being at home – there is no need to sit on your bed to work, eat and watch TV. Instead you have a desk to work at, a sofa to sit on to watch TV, a washing machine to use as required and a kitchen to prepare a meal in plus most apartment buildings have 24-hour security! And why not book one with a balcony to enjoy a bit of the outdoors.